$10 Buys a $50 Restaurant.com eGift Card! May purchase multiple deals. 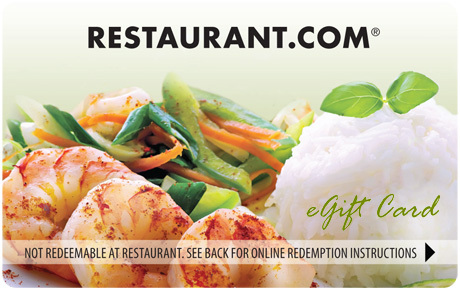 Restaurant.com eGift Card can be used in denominations of $5, $10, $15, $25, $50, $75 or $100. Customers may select any number of restaurants over time, totaling $50. Valid for parties of two or more unless otherwise stated. Valid for dine-in only unless otherwise stated. Un-redeemed gift certificates not valid toward purchase at restaurants. Limit of one (1) gift certificate per restaurant per visit. Minimum spend requirements and other restrictions on the Restaurant-Specific Gift Certificates and online merchant websites vary and are subject to change. No cash value. Visit http://Dine.Restaurant.com for complete terms and conditions and participating restaurants.